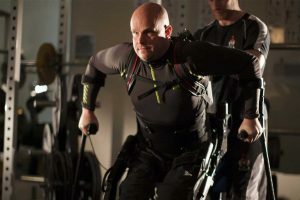 Exoskeleton rehabilitation aids physiotherapy rehabilitation to allow many patients the ability to take part in a set of supported walking and stretching exercises, designed by specialist physiotherapists to help achieve and maximise rehabilitation goals. Wheelchair users are at risk of developing numerous medical complications from extended periods of sitting. By enabling them to spend more time standing, walking and exercising, using the exoskeleton may offer significant health benefits. Many studies provide preliminary evidence on the efficacy of exoskeletons on cardiovascular health, energy expenditure, body composition, gait parameters, level of physical activity and quality of life. Exoskeletons such as the Ekso GT aid both restoration of locomotion and increased levels of physical activity years after injury. Furthermore, they decrease seated time, increase standing and walking time. Decreased sitting time is likely to ameliorate several of the health-related consequences of prolonged sitting and reduced activity. All of the above conditions may have an impact on the quality of movement, daily activities, work and leisure interests. Of importance is that many symptoms directly associated with these conditions can respond positively to physiotherapy intervention. Neuro-Physiotherapy therefore plays a pivotal role in managing neurological disorders by employing our expert skills in movement analysis, skillful handling and functional rehabilitation. Through specific handling we aim to guide a person to perform everyday functional tasks to the best of their ability. Group exercise classes are more than the loud music, fast movements and shouts of encouragement that are seen and heard in a fitness room. These one-hour blocks of time offer social inclusion opportunities, health benefits and psychological support through a variety of different exercises and programmes to improve your physical fitness. Improve self-esteem in these same children. We can tailor an exercise programme to suit all levels of disability to provide a productive, safe and fun environment for either groups or individuals to maintain health, strength, and endurance.